Yippee for our handy Daddy! He got a new circular saw for his birthday and was very excited to try it out on his latest project. 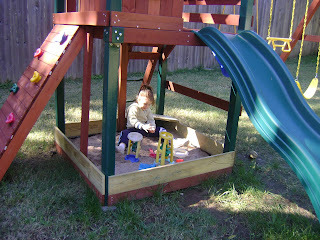 Avery LOVES sandboxes and we decided she needed one of her own. 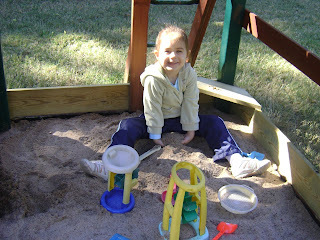 Craig added boards to the sides underneath the tower on her swingset and filled it with sand. (He is still going to add a few more bags.) He even gave her a seat in the corner! He is getting to be quite the handy husband and always does things himself! If he doesn't know how, he figures it out and learns and I am so proud of him for that. Avery loves her sandbox and I know she will have a lot of fun in it! !